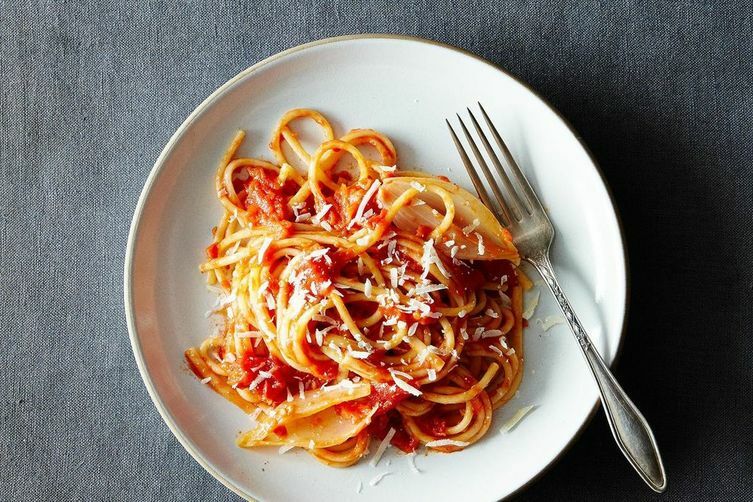 How two-minute pasta, chickpeas, and a lot of eggs have saved us on uninspired nights. The dish I didn't cook last night—even though I promised myself I would. Amid an office that's filled with the type of people who bring homemade quiche for lunch, regale me with stories of the previous evening's lamb chops, and casually display their culinary prowess by poaching an egg in the team kitchen, I don't always want to cook. Despite my belief in Food52's Cooking Manifesto ("How you eat is how you live. "), the countless hours I spend styling, eating, and writing about food, and the fact that I have more cookbooks on my nightstand than novels, when I finally get home at the end of the day, I often find myself lacking the motivation to actually cook. In the battle between making Richard Olney's Chicken Gratin (which has been on my to-cook list all month) and going to bed at a reasonable hour, bed always wins. I'm sorry, Richard. Instead, I rely on a time-tested stand-by: plain pasta. My all-too-frequent routine goes something like this: I stop by the grocery store and make a bee-line to the basil and cherry tomatoes (I'd like to say I use canned tomatoes in the winter, but since this is a confessional post, I'd feel wrong lying to you). Once home, I cook the orzo I keep stock-piled in my pantry in highly-salted water, stir the tomatoes (halved if I'm feeling fancy, but I'm usually not) into the still-warm pasta, add torn basil and some olive oil, and eat it with a spoon out of a huge bowl, and by bowl I mean the pot I cooked it in. Ali: Toast with two fried eggs on top, possibly with hot sauce and ketchup. To make it, I toast the bread, fry eggs in butter (I have one pan that fits them perfectly), and top them with a squiggle of ketchup and a pop of hot sauce. Kenzi: It's no secret—when Kenzi needs something in under 15 minutes, her she turns to her egg tacos. Caroline: I tend to make a very buttery egg-in-a-hole and use the little cut-out piece of toast as a vehicle for jam. 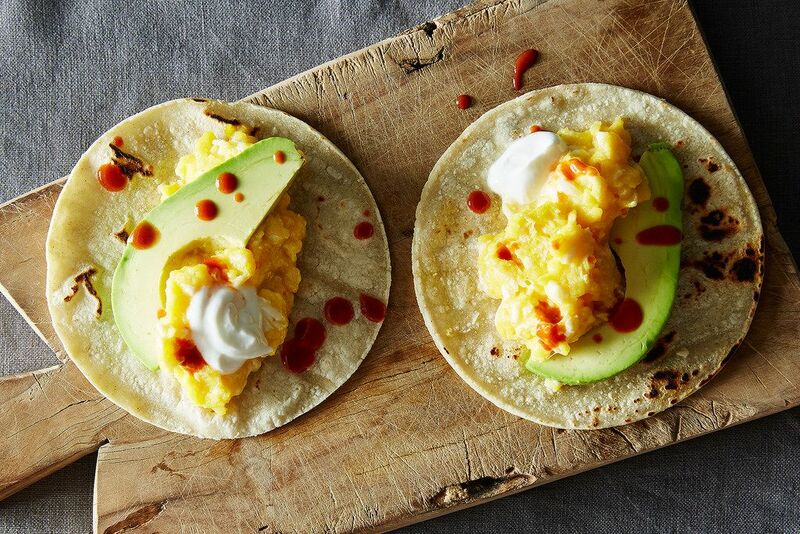 I also make Kenzi's scrambled egg tacos a lot. But the best thing is roasted chickpeas with olive oil and lots of red pepper flakes and salt—and a cold beer. Bridget: Eggs eggs eggs. Literally just finished a spicy pepper-zucchini frittata with leftover vegetables. Sarah: Eggs—especially in matzo brei (! )—and chickpeas gently fried in a cast iron skillet. Mostly just cereal, though. Madeline: A can of beans with lots of vinegar, whatever veggies I see, and a fried egg. This is great because it's so filling, and I am really hungry all the time (I would blame marathon training, but honestly I think I've always been like that). 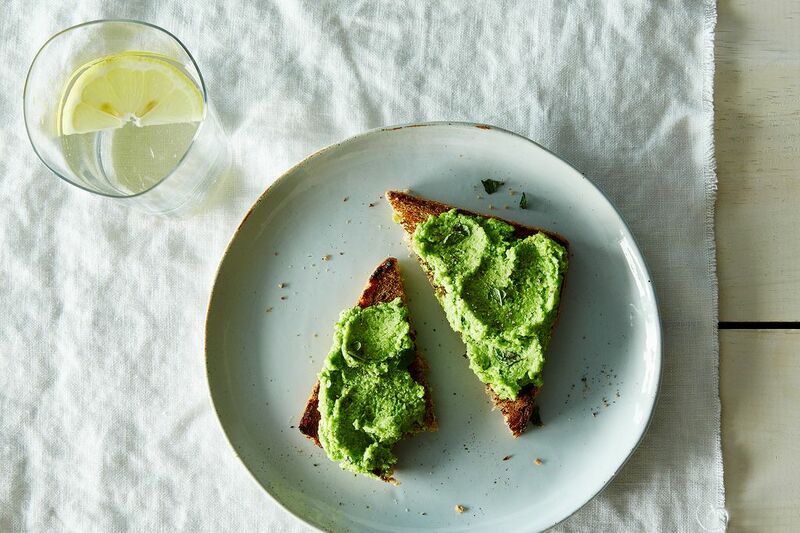 Lindsay-Jean: Avocado toast, or, similarly to Riddley, smashed chickpea salad. 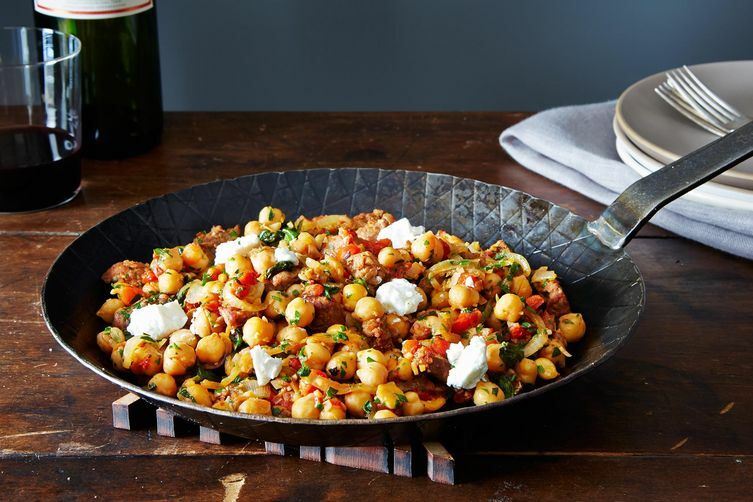 Amanda: Sometimes I will just mix chickpeas in a bowl with lemon, olive oil, and salt and eat them with a spoon—no mashing or frying required. Actually so good. Gabi: Butter on a toasted baguette (always on hand because I buy, slice, and store it in the freezer). I add fig jam or honey if I'm in a sweet mood, and extra salt if I'm not. Kristen: Olive oil-fried bread—either as toast with stuff on top (tomatoes, fried eggs, beans, greens, leftovers), or in a panzanella with similar stuff all around it. Riddley: I keep a batch of Marcella's Tomato Sauce in the freezer—that, thawed, with pasta is prefect. Also toast and all its toppings (avocado forever!). Also canned, drained chickpeas, semi-mashed with lemon juice, Parmesan, salt, pepper, and maybe some minced parsley, and eaten with crackers. Taylor: Cut up a potato, throw in a little salt, pepper, olive oil, rosemary, and a half a shallot, and throw it in the oven until it's done. 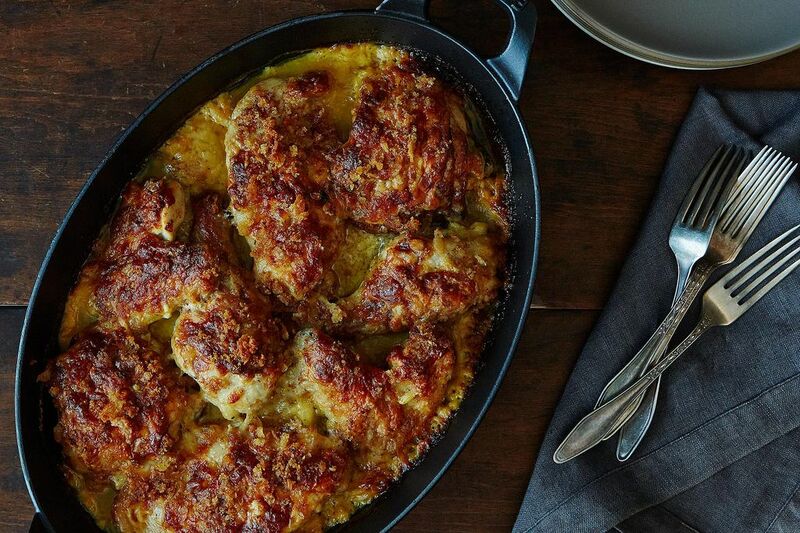 The ultimate comfort food for winter. What do you cook when you just don't want to? Tell us in the comments below! Pita and veggies with hummus and olive oil is my go to if i just. Can’t. Cook. If I have 10 mins of cooking in me then it’s my bag of “emergency” gf pasta with pesto (I always have this on hand), and cherry tomatoes and fried mushrooms. And i’m not gonna lie, on occasion the banana protein pancakes have made an appearance at dinner time lol. Cottage cheese with fresh fruit, sprinkled with nuts. Cottage cheese with my homemade applesauce, nuts and raisins. Pasta with my homemade marinara sauce or pesto, both of which are always in the freezer. And, of course, bacon and eggs. I swear all these comments should be in a word document on my desk top to glance through when you don't feel like cooking dinner. I am doing that right now! Thanks ya'll! Quesadilla with green chilies. Also try grilled cheese with green chilies :) Pasta sauce on veggies (potato, eggplant, red peppers), cottage cheese and fruit, cereal and greek yogurt. I think I love Sarah: "Mostly just cereal, though." Thanks for keeping it real! Can of Black Beans. Can of roasted tomatoes. Cook with a bit of chopped onion and sprinkle with grated cheddar. My go to is a slice of toasted sourdough drizzled with a bit of olive oil then topped with garlic hummus, diced red bell peppers, sunflower seeds and spicy sprouts and finished with a sprinkle of Hot Shot (ground black and red pepper). So very satisfying! I hate all those pasta/bread heavy meals. I slice cold chicken, a little cheese, some grapes or apples, almonds, and I snack. Or I buy some leafy lettuce and put the above ingredients into a salad. Or a black bean and corn salsa...just beans and frozen corn mixed with salsa and cilantro. Add a little chicken and cheese and top a potato or salad with it. Or just eat it by itself. If I feel like cooking rather than assembling, I'll slap any of the above ingredients into a soft tortilla and put it in my panini press for a quesadilla. Leftover cold rice with kimchi, nori flakes, sesame seeds, tamari. If I'm 15% up for cooking, I'll goad myself into making a black bean soup. Sautee a chopped onion and a clove of garlic. Pour over a can of black beans, add a little water (or broth if you've got it). Add cumin, dried oregano, chili or cayenne powder, salt, black pepper. Simmer for a few minutes. Hopefully you've got a lime and some fresh cilantro laying around. If you don't, a dash of white wine vinegar will have to do. Diced avocado is always always always a welcome addition. Finish with Tapitio. I'm single, so there are almost always leftovers in the freezer. That said, if I'm caught without them, I head for the pantry staples: canned chicken, something tomato-ey, chicken stock, brown rice, black beans, and chili peppers. Add in garlic, onion, oregano, and cumin, wrap it in a warm tortilla, and serve with a cold beer. Comfort food for people who don't want to think too hard. Linguini or spaghetti with lemon zest, lemon juice, & parmesan, or asparagus grilled and chopped with parmesan or romano, cherry tomatoes, arugula, olives & nuts. I cook a pot of beans (black, red, pink, white, whatever) every weekend, with onions, garlic, a variety of added flavors and eat a bowl whenever I don't want to cook; they last a week or more. I throw canned tomatoes with basil or pesto in the blender, heat up with a little almond (or other) milk. Cream of tomato soup! Another thing I do is heat the oven to 450, place fresh veggies on a tray, and roast til done. You can do whole or sliced potatoes, sweet potatoes, zucchini, brussel sprouts, peppers, mushrooms, eggplant... just watch and take them out when soft. My whole meal, with maybe a handful of nuts for dessert. Breakfast for supper--Instant oatmeal with fruit. Scrambled eggs with leftover vegetables thrown in. An English muffin with peanut butter. keep broth baked brown rice (or farro, bulgar, or barley) in the fridge. plop cherry tomatoes in the bottom of a microwave bowl, cover w/ brown rice, add a tiny bit of broth or water, and then a bit of cheese (whichever you prefer). Microwave, liberally pepper, and eat. Filling & easy - adjust as preference dictates. I make fresh pesto in batches sometimes and freeze it in an ice cube tray, so I always have it for my go-to quick fix: fry some gnocchi in a pan, add fresh tomatoes, mozarella and the pesto. Delicious. Takes 10 minutes tops.